Thunderbolts Forum • View topic - EU Theory predictions for LCROSS moon impact mission? Re: EU Theory predictions for LCROSS moon impact mission? Here is the report from Friday on the PBS NewsHour. The transcript is up along with the streaming Video. I like how they captured the essence of the press questions. I don't know if they represent the press being stupid or asking if NASA thinks they are stupid. This is the article by the LA Times reporter who asked the question. 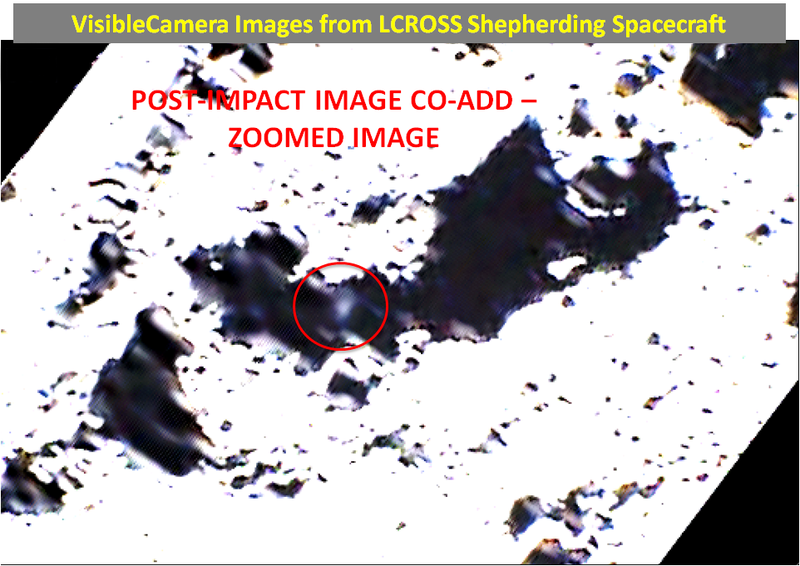 If nothing much comes of the event the coverage of LCROSS will vanish just like the Gravity Probe B did. “Sodium near the Moon’s south pole went from zero to blazing just after the impact!” Dr. Wilson reported to colleagues back in Boston. As a minor component of lunar regolith, I wonder how much sodium vapor would be liberated by impact alone. It will be interesting to see if the electron temperature of the sodium showed any signs of being in the presence of a strong electric field. PIezo-induced sodium vapor arc, or just thermally induced by heat of impact? Some "interesting" patterns in that impact flash. Jelly bean shaped with several radial "spokes" between a surrounding, oblate pattern of light and dark circles. Could be camera saturation artifacts, although I wonder how much the Mid-Infrared camera is subject to that. 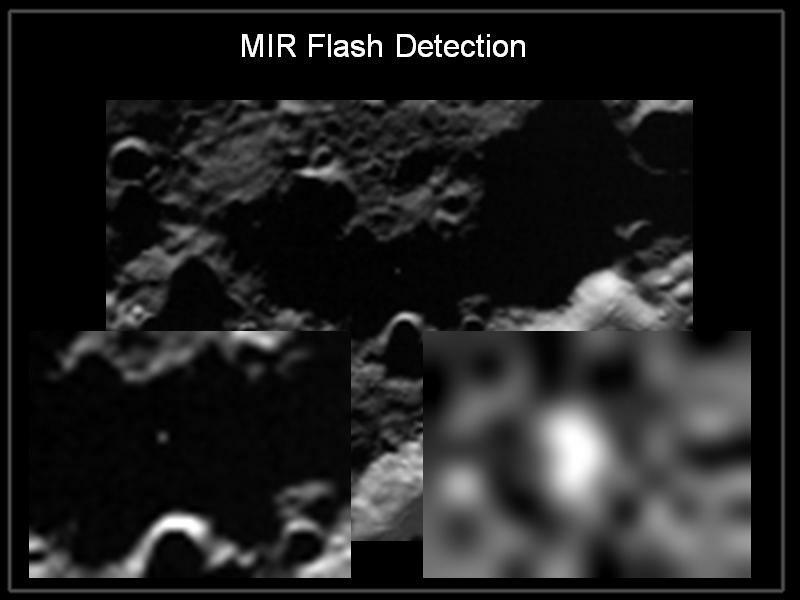 Plus they said the Centaur impactor was tumbling when it hit, and a bright flash in that dark shadow would highlight the surrounding terrain so the patterns could be as mundane as either of those two scenario's. The flash covering several pixels was mentioned as "interesting" in the press conference so it will be "'interesting" to see their analysis. allynh. The reporters almost exclusively focused on two things; The lack of a visible debris plume and lack of any conclusive announcements from data analysis, a mere two hours after impact when NASA personnel barely had time to prepare for the press conference in the first place. The "reporter" from Reuters (who looked and acted more like a sophomore writing for a high school yearbook) was especially annoying, like a kid who throws a fit 'cause they can't wait 'til Christmas to see what's in the box. It seemed that the NASA folks on the panel were getting frustrated with their repetitious questions as well. I mentioned it as a reflection of the sad state of "journalism" in the US, which is more concerned with infotainment soundbites and the antics of the rich and famous than anything of real substance, contributing to the dumbing down of our culture and a primary reason why I don't watch TV. Confirmed: How The Moon Produces It's Own Water. The SARA results confirm that solar hydrogen nuclei are indeed being absorbed by the lunar regolith but also highlight a mystery: not every proton is absorbed. One out of every five rebounds into space. In the process, the proton joins with an electron to become an atom of hydrogen. "We didn't expect to see this at all," says Stas Barabash, Swedish Institute of Space Physics, who is the European Principal Investigator for the Sub-keV Atom Reflecting Analyzer (SARA) instrument, which made the discovery. The incoming protons are part of the solar wind, a constant stream of particles given off by the Sun. They collide with every celestial object in the Solar System but are usually stopped by the body's atmosphere. On bodies without such a natural shield, for example asteroids or the planet Mercury, the solar wind reaches the ground. The SARA team expects that these objects too will reflect many of the incoming protons back into space as hydrogen atoms. This can be directly applied to comets as well to explain the OH, H2O, Na and H in the coma. Confirmation of a vapor/debris plume. 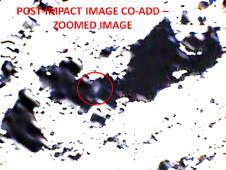 Zoomed in image of the impact plume. The extent of the plume at 15 sec is approximately 6-8 km in diameter. I'm thinking that craters which appear to have been formed by EDM (circular and flat bottomed) would have a brittle, cinder-like crust (similar to slag), covering a hard, fused layer underneath. I expect the debris will consist of fine, micron sized particles and meter sized rocks, with very little inbetween. Considering the plume was as wide as it was tall, I suspect the depth of the impact reached the fused layer, producing considerable lateral force on the impact debris. 15 seconds after impact with a diameter of 6-8km would be a lateral velocity of ~0.5km/s or 1,800km/h. Perhaps the plume brightness was at the low end of predictions because there was more lateral distribution of material making the plume more diffuse/less bright. * It's nice to see the plume. What I'm most curious about now is whether it's merely the result of an impact of a solid object, or if there's any evidence of electric discharge forces involved. I'm going to guess that the difference in potential was not enough to cause any transmutation. I think what Sol is getting at is that this particular impact crater is going to be just that- an impact crater. It is going to have completely different characteristics than most of the other craters across the moon, and stand in confirmation of the EU theory that most of the other craters on the moon were created by electrical means. I think what Sol is getting at is that this particular impact crater is going to be just that- an impact crater. Right. The only discharge I would expect would be of the piezoelectric variety, or possibly some ionization interaction of the shepherd probe with the plume as it flew through it. I'm not counting any explanations I've offered regarding the physical structure of the lunar soil in the impact zone as any sort of prediction...too many unknowns for that. But EU would predict signs of EDM in a crater like that. In the meantime, far-ultraviolet spectra taken by another craft, the Lunar Reconnaissance Orbiter, as it flew over the impact site shows no obvious signs of water. Instead, the spectra show signs of what may be iron and mercury, says Gladstone, a mission scientist. No obvious signs of water. Looks like we might have 3 successful predictions so far. Sodium Silicate/Ferrous Sodium Silicate "slag" covering a fused iron/mercury layer? Briefing will be on 11/13 @ 9:00am pst. MOFFETT FIELD, Calif. – NASA will hold a news conference Friday to talk about early science results from its successful moon impacting mission, the Lunar Crater Observation and Sensing Satellite, or LCROSS. The satellite gained worldwide attention when it plunged into a crater near the moon's south pole on Oct. 9. I'll be watching and will relay their findings here. Sounds like they found a chemical soup. I wonder how much H2O is actually present in the data, or is it mostly inferred by the signature of "water groups" and OH, of which there is a specific, strong OH signature. Given the seeming abundance of sodium, volatiles, organics and OH, I wonder how much H2O, and or OH, might be a product of chemical reactions, if any, and how much was already there, if any. Ice grains were not actually confirmed, although they said there is evidence for a small amount of icy grains, and apparently they're sorting out the specific water signature. The standard interpretation of the data regarding comets receives similar treatment with inferring the presence of water/ice by the water group and OH signatures, although the amount of water ice detected on their surfaces so far has been miniscule. Interesting that an earlier announcement, from the LRO, indicated there were no obvious signs of water, but there was iron and mercury. Makes me wonder how much is being inferred. Sodium, which was detected, is a strong catalyst involved in a number of chemical reactions producing water as a by product. The presence of free sodium tells me that water produced by chemical reactions (specifically acid/base neutralization reactions) is a strong possibility. They did mention there were changes in certain spectra that indicated chemical reactions in progress. Not trying to deny they may have found water, but there may be other scenario's to explain the data. They also said that the newly discovered hydration cycle might be a source of trapped water. They also hinted at a comparison to cometary material. There was more fine dust than expected, that went higher and stayed aloft longer than predicted, which provides a lot of surface area for chemical reactions to take place. It could also indicate an electrostatic charge. No mention of electric or magnetic field data, which might show up in the details of the spectra, or as polarization in the photometer on the sensing/shepherd craft. I guess they're going to provide updates as they progress with their analyses of the data. * If there's significant amounts of OH, that's good enough to make water, I think, even if there's no actual water. 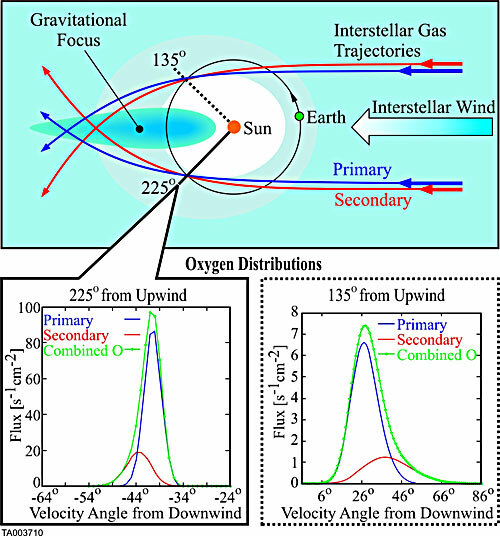 The solar wind protons [= hydrogen nuclei] should make it easier to convert OH into H2O. I’ve said it before, but nobody ever did pay any attention when I talk. The IBEX mission carries 3 sensors – 2 for H ENAs, and 1 for neutral Oxygen. The link above shows the approximate points in the earth’s orbit (and by default, the moon) where we pass through the O streams, asymmetrically centered around both hemispheric summers. The earth and the moon are being bombarded with H and O that originates from the ISM. There is no need for exotic chemical reactions, or an earth that was bombarded by billions of dirty snowballs, or speculation of water that formed in a supposed accretion disk billions of years ago still “hanging around”. Water is still forming throughout the solar system right now. In fact, it should be forming at an even faster rate considering that the sun is at a century-class solar minimum, because collisions are the primary mechanism through which they are interrupted in their journey toward the sun prior to reaching 1AU. Being neutral they are not affected by the IMF, and are expected to have an 80% survival probability @ 1AU, before the solar wind starts to deplete them greatly through ionization. It should be no surprise that they “burn off” when exposed to direct sunlight on the lunar surface during the lunar day either, the same thing occurs on the surface of the earth on a daily basis. NASA announced today that they've found traces of a lot of water and other stuff in the plume analysis. I still have a letter in to their lab asking what they might have done to vent all the lox and hydrogen out of the Centaur so that it wouldn't register in the plume. Let you know if I get a response. I'm hoping they vented it right after the de-orbit burn so that it wouldn't just follow them into the crater.